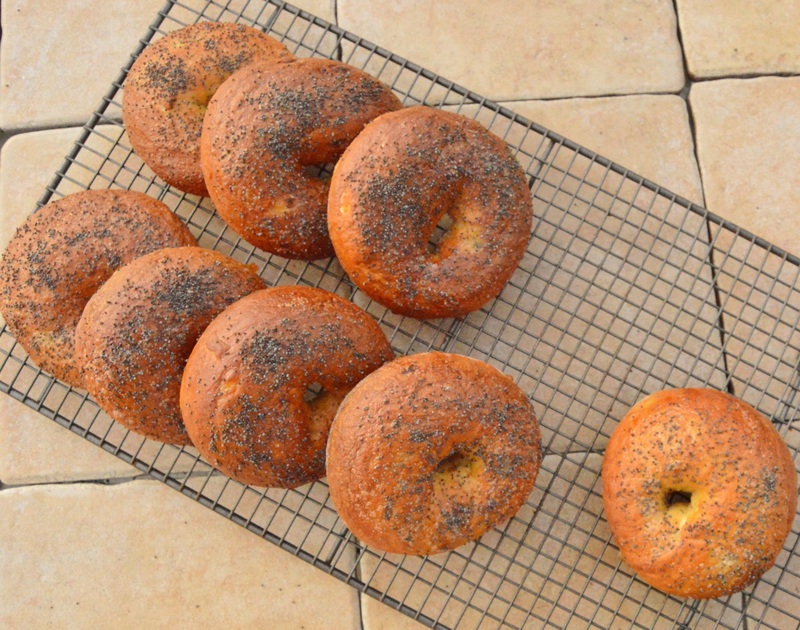 Even though bread making is one of my favourite things in baking, I have only made bagels a couple of times. Now, I adore them with cream cheese and smoked salmon, but just toasted and buttered (and it really must be butter!) is a joy for me! It is something of a challenge to buy really good bagels, and even the fairly average commercial bagels are not cheap! So as I hadn’t made them in years, I felt a couple of batches were needed: one plain, the other flavoured with onion, and sprinkled liberally with poppy seeds, sesame seeds, with some having a mixture of both. To make bagels you essentially shape and then briefly boil the shaped and risen dough – a firmer dough than is typical for bread – before baking, resulting in a very chewy bagel with a great closed texture. Onion bagels are my favourite bagel flavour. The onions are sautéed very gently for about 20 minutes in a little butter until they just turn golden-brown, although you can take it further and caramelise them. You can top the bagels with sesame seeds, poppy seeds, onion seeds or a mixure of these – or simply leave them without a topping! A very slow prove: bagels deserve it! 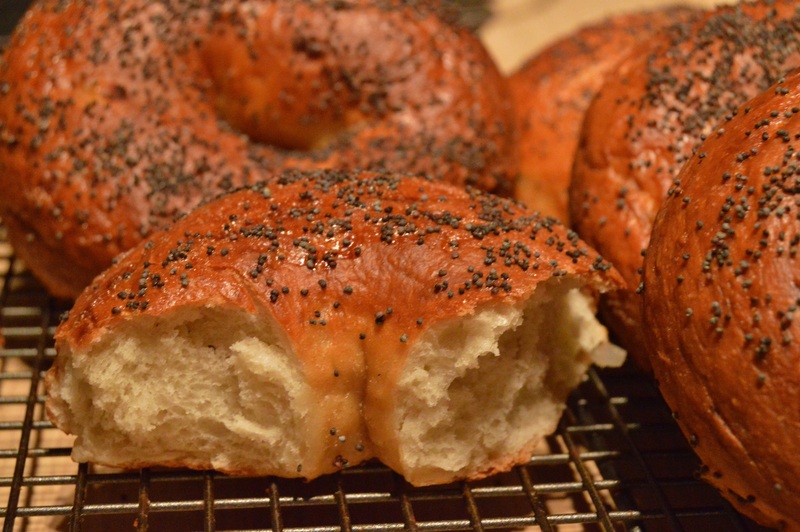 As with most breads, bagels cannot (and should not!) be rushed; the initial dough is left to prove very slowly at least overnight in the fridge. 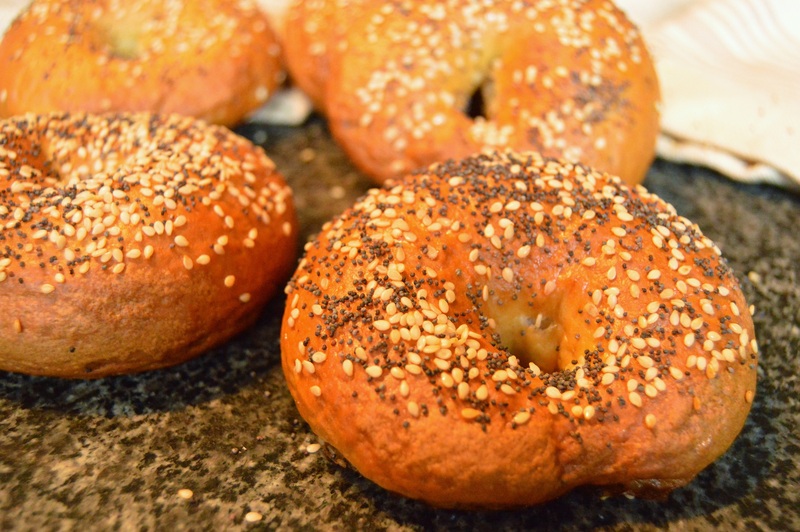 You get a massive flavour jump in bagels following a long prove; short-cut bagels, rising in a warm place for just a few hours, will still taste better than what you can buy, but will have nothing like the flavour you should be getting. 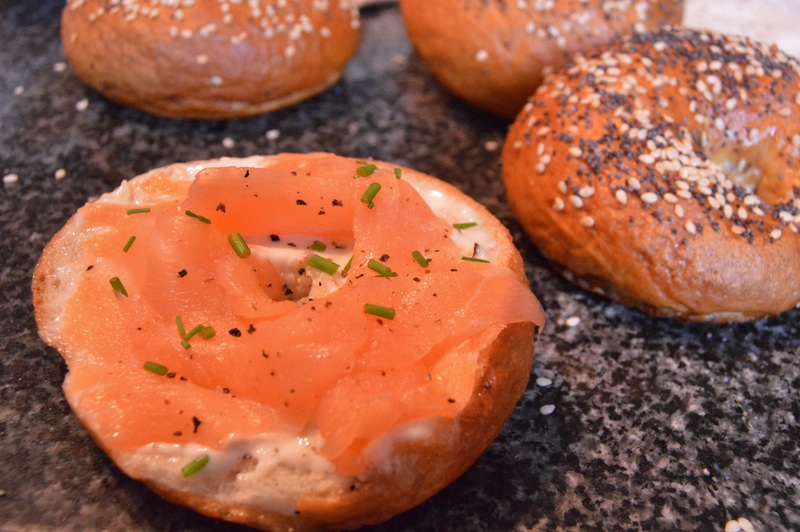 toasted bagels with cream cheese & smoked salmon – divine! I recall the first time I made bagels, with several of them collapsing before my eyes as I lifted them off the greaseproof and into the boiling, even though they hadn’t been over-proved (which with bread can lead to collapses). (1) Once you have shaped the dough into bagel shapes, place each on its own small square of non-stick greaseproof to rise. Once risen, using a spatula and going underneath the greaseproof, place the risen bagels, plus their greaseproof, face down into the boiling water initially. This ensures no collapsing will occur – and the greaseproof will peel off effortlessly after the boiling, if not during the boiling of its own accord! As you are not handling the shaped dough, there is no risk of over-stretching or mis-handling it. (2) Alternatively, freeze the shaped and risen bagels until solid on the pieces of greaseproof they rose on and on a baking tray. Once they are all frozen pop them in a bag and keep in the freezer*. You then peel off the greaseproof and plunge those frozen ones into boiling water for just over 1 minute before baking. (3) Bake the bagels as soon after poaching as possible: if they sit too long out of the water they are prone to wrinkling. A wide pan is best as you can poach several at once, remove them, top them with goodies and pop them straight into the oven while you poach the others in batches. 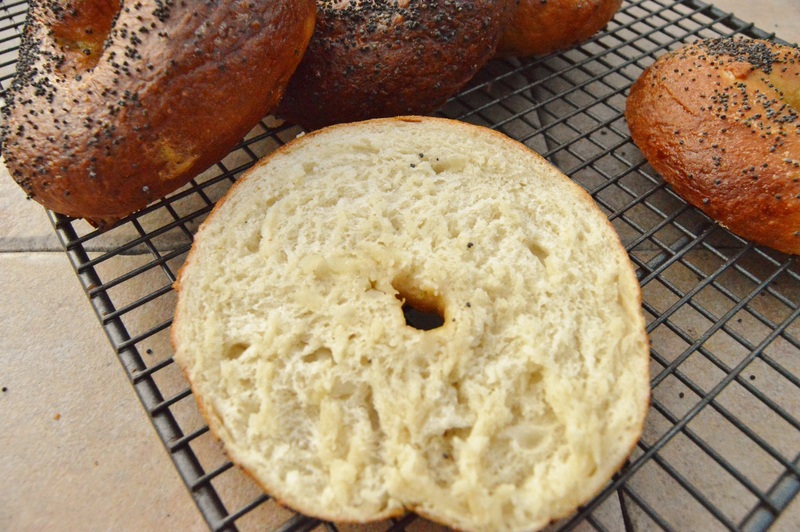 *The risen bagels can stay in the freezer for several weeks or more so that you can have freshly-made bagels quite quickly: simply take them out of the freezer, poach them and bake them. flour: go for the highest gluten flour you can find. The very strong bread flours are best but you get excellent results with standard strong bread flour. water: less water is used in the bagel dough than most breads. This is essential for the denser structure of a bagel. (1) Heat the butter/oil in a small pan and gently fry the onions for about 20 minutes until soft and light golden. Leave to cool. (2) Mix the flour, salt and yeast in a bowl and mix in the onions. Add the malt syrup (or honey) and 260ml of the water and stir until it forms a fairly firm dough with no dry bits, adding just a little more water if needed. 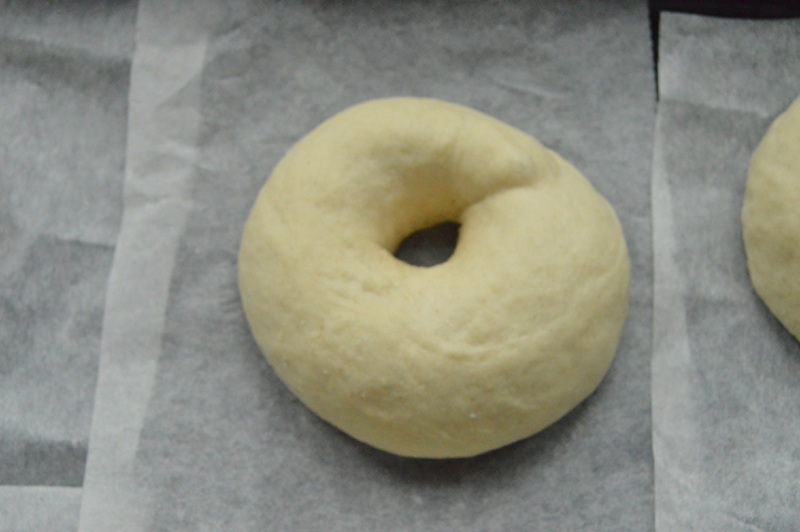 NB: differently to many bread doughs, less water is used for bagels and you want the dough to be quite firm. (3) Knead well for about 10-15 minutes until very elastic and place the dough in bowl, cover with clingfilm. Chill at least overnight for its first rise – ideally for 24 hours or so. NB: the smaller amount of yeast will ensure the dough does not over-prove and take over the fridge during the long chill! (4) Turn the dough onto the unfloured work surface and knead for a few moments. Divide into 10 pieces (each about 100g). Roll each piece on the work surface roll each piece of dough into a long sausage shape with one end slightly tapered and bring together to form a ring, pinching gently to seal; this tends to gives a more rounded bagel shape, as well as being smoother, owing to the higher surface tension of the dough. You can take time to make them perfectly uniform or go more for a home-made look as I have done! However, I have found that the uneven ones, once risen and cooked, look practically the same! NB: alternatively, roll the each piece of dough into smooth balls and poke a floured finger through the middle of each. Then use two fingers to gently open up the hole to give clear rings of dough, making sure there is a very sizeable hole: when they rise, the hole will become smaller so it needs to be large before proving. 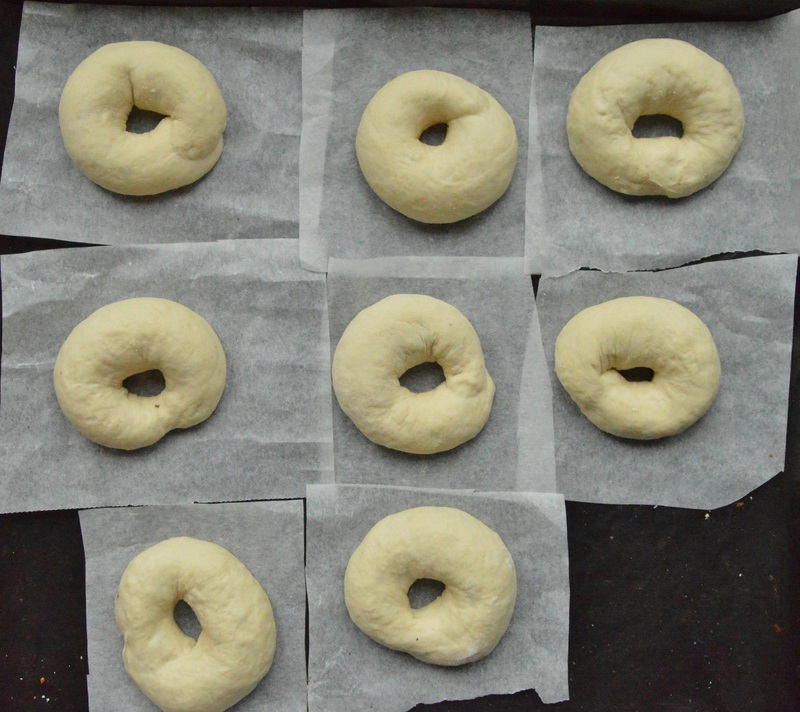 (5) Place the dough on baking sheets onto which squares of non-stick greaseproof have been placed (one for each bagel). Cover with cling film or place inside a large bin liner and leave to rise at room temperature for about an hour, until a little risen but not puffy: the dough should still be fairly firm but with a bounce to it: it is important not to over-prove or they might collapse. At this stage you can either boil them now (step 6) or else remove the clingfilm and freeze the dough on the trays for boiling at a later stage (in which case boil straight from frozen). (6) Before boiling, make sure the oven is preheating to 200C(fan). Into a large wide pan of boiling water, stir the bicarbonate of soda and salt. Add the bagels, frozen or otherwise, top side in first, and poach gently for one minute, before turning over and poach for a further 30 seconds. Flip over again in the water and carefully peel off the greaseproof. You will probably need to do this in batches. (7) While they are boiling, line a baking tray with a double thickness of non-stick greaseproof or silicon sheets. Carefully remove the bagels and place them on the baking tray. Brush with egg white and sprinkle over poppy seeds and/or sesame seeds. (8) Bake immediately in the oven for 15-20 minutes: they should be crisp and deep brown. Transfer to a wire rack to cool.